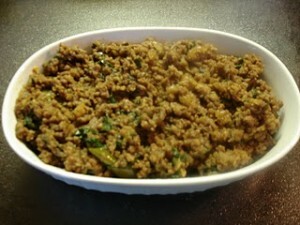 Dal Mash And Qeema recipe by Nazia Nazar at DesiRecipes.com. Heat oil and brown onions. Add ginger /garlic and fry after that add mince and fry. When brown add haldi , chilly powder, salt , little water and fry. When it leaves oil, add dal and fry. Add enough water for dal to be soft. Add green chillies, coriander leaves and all spice and put on dum. good,not bad i only saw the recipie but not yet tasted. Is this dal same with melon? Can it be used to make African soup?